After crossing the North Anna River, Ulysses S. Grant’s Union forces headed toward Cold Harbor. Private Augustus Du Bois marched forward at daybreak on June 3, 1864, along with hundreds of other members of the 7th New York Heavy Artillery regiment to a thin belt of timber a mile south of the key road junction of Cold Harbor. On the near side of the woods, the 1,700-man strong regiment halted to await the firing of a cannon that would signal the beginning of the charge. The regiment’s objective was a line of field fortifications that crowned a low ridge. Behind the breastworks, battle-tested Confederate soldiers were packed tightly together, waiting calmly for the attack to begin. If the Federals could punch through General Robert E. Lee’s line, it would enable the Army of the Potomac to march into Richmond and end the war. The Confederates did not expect them to succeed. The fighting spilled over to the defenders’ side of the fortifications. The contest was a grim one, but the Federals retained the advantage. Hundreds of graybacks were forced to surrender or lose their lives. The 7th New York of Brig. 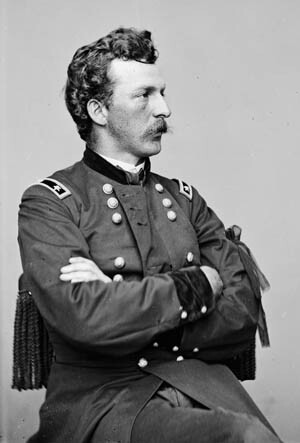 Gen. Francis Barlow’s 1st Division appeared to have pulled off a significant victory. The regiment had captured a portion of the first line of the enemy’s works belonging to Brig. Gen. John Echols’s brigade of Maj. Gen. John C. Breckinridge’s division. If the breach could be widened, two entire Confederate divisions, Breckinridge’s and that of Maj. Gen. Cadmus Wilcox, would be cut off from the rest of Lee’s army situated to the north. It was a promising beginning to the Union attack. Federal generals at all levels of command had been instructed by Army of the Potomac commander Maj. Gen. George Meade to heavily reinforce any local success, no matter how small, with fresh troops. If Meade’s generals heeded his advice, victory might be achieved under the hot summer sun. For nearly a month, Lee’s Army of Northern Virginia had held off Meade’s army, under the watchful eye of overall Union commander Lt. Gen. Ulysses S. Grant. With luck and determination, the Federals might end Lee’s unblemished record of tactical victories over the Federals in Grant’s ongoing Overland Campaign. The Army of the Potomac had tried several times in the preceding month to slip around Lee’s right flank following the massive Battle of the Wilderness on May 5-6. Unlike his predecessors, Grant was determined to continue his drive south despite suffering heavy losses. Lee’s army, which had the advantage of shorter routes of march that enabled it to entrench before the Federals could get set for a fresh assault, fought its opponent to a standstill at Spotsylvania Courthouse and again at the North Anna River before the armies shifted southeast to Cold Harbor in late May. As yet another major battle brewed, both sides sought to reinforce their depleted ranks. Grant had to deal not only with 40,000 battlefield losses, but also with the expiration of three-year terms of enlistment by many of the veteran regiments mustered into service during the first year of the war. Grant’s solution, supported by President Abraham Lincoln, was to pull entire regiments of heavy artillery units from Washington and Fort Monroe, Virginia, and convert them into infantry. These full-strength regiments, known as “Heavies,” received orders in mid-May to join the Army of the Potomac in the field. Once they arrived in camp, the regiments were inserted into veteran brigades as a way to offset their lack of experience. Altogether, the Army of the Potomac had received 33,000 replacement troops by the time it reached Cold Harbor. 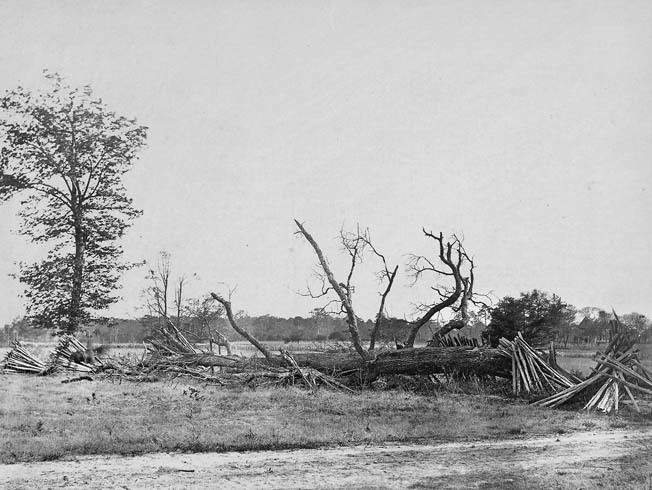 The dilapidated tavern at Cold Harbor was used by General Winfield Scott Hancock for his headquarters. The somewhat confusing place name was an old English term referring to a tavern that did not offer hot meals with its overnight accommodations. When Lee learned that Grant had transferred Maj. Gen. William Smith’s 16,000-strong XVIII Corps from Maj. Gen. Benjamin Butler’s Army of the James to Meade’s army, he appealed to Confederate President Jefferson Davis for additional forces of his own. After nearly a week of wrangling between Lee and General P.G.T. 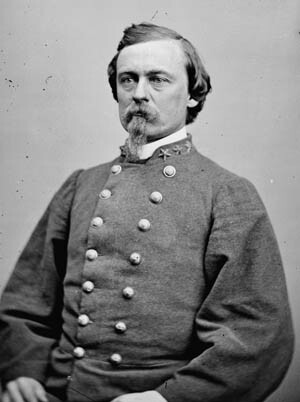 Beauregard over the former’s desperate need for reinforcements, Beauregard finally relinquished Maj. Gen. Robert F. Hoke’s division on the night of May 30. Lee rushed them to Cold Harbor. 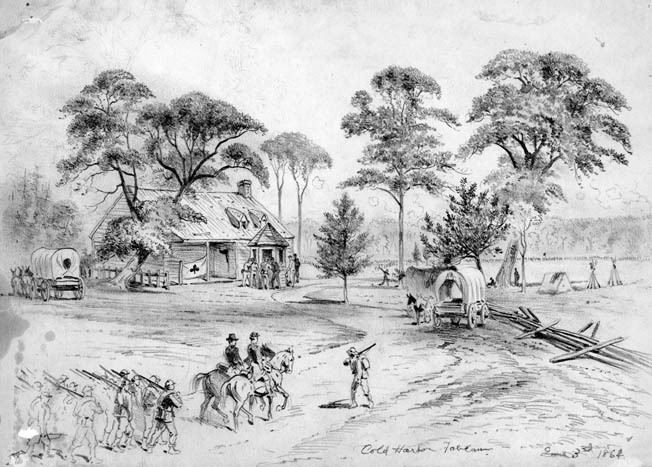 The crossroads at Cold Harbor was a dilapidated wayside tavern of no particular distinction. The somewhat confusing name was an English term that referred to the lack of a hot meal at an overnight accommodation. The value of Cold Harbor lay in its significance as a strategic crossroads midway between Totopotomoy Creek and the Chickahominy River. Lee prized it as a way to prevent Smith’s XVIII Corps from having an unobstructed path to Richmond, while Grant and Meade sought to deny it to the Confederates for use as a base from which to disrupt Federal supply lines. On the afternoon of May 31, cavalry from both armies clashed at the crossroads. By the end of the day, the Federal cavalry had secured the crossroads and waited for infantry to relieve it. For the next two days, Lee and Grant steadily built up their infantry forces in a line that stretched several miles above and below Cold Harbor between the two waterways. By the morning of June 2, Lee’s line stretched for seven miles from Totopotomoy Creek in the north to the Chickahominy in the south. With each flank anchored on a riverbank, the only way for the Federals to reach Richmond was to fight their way through Lee’s army. Lee shifted his forces as needed during the preliminary fighting at Cold Harbor, splitting Lt. Gen. A.P. Hill’s III Corps with one of its divisions placed on the left flank and two on the right. By the morning of June 3, the Confederates were deployed as follows: Maj. Gen. Jubal Early’s II Corps and Maj. Gen. Henry Heth’s division of Hill’s corps were on the left flank; Maj. Gen. Richard Anderson’s I Corps was in the center; and Hoke’s and Breckinridge’s divisions and two divisions of Hill’s corps were on the right. Grant’s mistaken decision to postpone a major attack on the entire Confederate line gave newly arriving Confederate divisions ample time to improve their entrenchments. The Southerners labored tirelessly to build earthworks that were tall enough to stand behind and also were configured to provide interlocking fields of fire to catch any attacking units in a deadly crossfire. The 7th New York Heavy Artillery of Brigadier General Francis Barlow’s 1st Division made a spirited attack on the Confederate works at Cold Harbor. They overran the first line of Lee’s defense, capturing prisoners and turning captured guns on the Confederates before being pushed back when their success went unsupported. The nearly manic effort the Confederates put into the construction of their defenses was readily apparent to the Federals opposite them. “We pass within apparently two hundred yards of the enemy’s lines, near which are a large busy corps of Rebel gray men cutting down trees; swinging their axes as if dear life depended upon their taking down a half a dozen trees at every stroke,” recounted a soldier from Smith’s XVIII Corps. Grant finally issued orders for a major assault on June 3 in the mistaken belief that the Confederates could not withstand a full-scale attack. Meade, who knew the Confederates were well entrenched, believed that such an attack was suicidal, but did not share those thoughts with Grant and instead passed along the order for the attack. Upon learning that a major assault was imminent, many Federal veterans wrote their names and addresses on slips of paper and pinned them on the backs of their coats the night before the assault to ensure that their bodies might be accurately identified and their next of kin informed of the time and place of their deaths. It was an ominous sign. The main attack, scheduled for daybreak on June 3, was to be made by the three corps on the Federal left flank. Left to right, they were Maj. Gen. Winfield Scott Hancock’s II Corps, Maj. Gen. Horatio Wright’s VI Corps, Smith’s XVIII Corps, Maj. Gen. Gouverneur K. Warren’s V Corps, and Maj. Gen. Ambrose Burnside’s IX Corps. The three corps on the left were to make the main assault, while the two corps on the right were to make a diversionary attack designed to prevent Lee from stripping units from his left flank to reinforce his right. Hancock’s corps had a reputation for hard fighting, and his officers fully intended to live up to that reputation. Hancock ordered two of his divisions to attack in strength, with the third held in reserve. Barlow’s division, on the extreme left of the Federal line, and Brig. Gen. John Gibbon’s on the right were to assail the Confederate right; Maj. Gen. David Birney’s division was behind Barlow’s. The two divisions on the front line stacked their brigades two-deep, with four brigades in front and four brigades directly behind. The Federal attack in the southern sector of the battlefield was scheduled to begin at 4:30 am. Fifteen minutes before that, Gibbon and Barlow each sent a regiment forward with orders to push back the Confederate pickets. At the arranged time, signal guns fired on Hancock’s front, indicating the beginning of the assault. Rain, which had been falling throughout the night, stopped as the assault began, but the damp ground gave rise to a thick mist that hugged the ground and made it difficult to discern distant objects. Any hope for the Federals to make a last-second observation of enemy positions was dashed by the foggy conditions. At the far left of the Union line, Barlow’s men exited the woods and marched in crisp lines through fields of tall, damp grass. As they entered the field, they moved at the double-quick in hopes of surprising the enemy. Colonel Nelson Miles’s brigade on the left was advancing against two brigades of Wilcox’s division, while Colonel John Brooke’s brigade was heading for two brigades of Breckinridge’s division. On the far right of Brooke’s 4th Brigade was the oversized 7th New York Heavy Artillery. Eager to ensure that his attack was made with as much élan as possible, Brooke rode into battle on horseback at the front of his brigade. 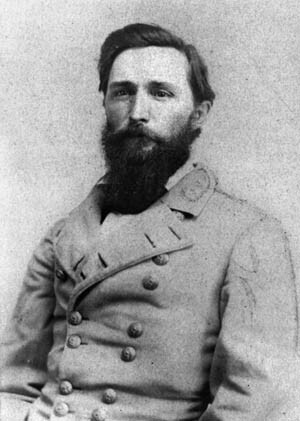 Colonel Alfred Colquitt, 27th Georgia. Barlow’s brigades had the misfortune to attack entrenched enemy forces on slightly elevated ground. If properly led, these troops would be able to halt Barlow’s attack before it reached their breastworks. The downside for the defenders was that in many places the trenches behind their fortifications had flooded due to the heavy rains. The trenches occupied by Lt. Col. George Edgar’s 26th Virginia Battalion had filled with water during the night, and Edgar had given his men permission to sleep on drier ground to the rear, leaving only pickets to man the flooded battlements. Rushing forward without firing their guns, Morris’s New Yorkers were able to reach the breastworks and engage Edgar’s pickets in hand-to-hand fighting. While some of the New Yorkers grappled with the pickets, others hurled themselves over the parapet and rushed into the lightly held fortifications. Realizing his blunder, Edgar rushed forward with the balance of his battalion to reinforce his pickets. In the ensuing melee, he was bayoneted in the shoulder and taken prisoner. 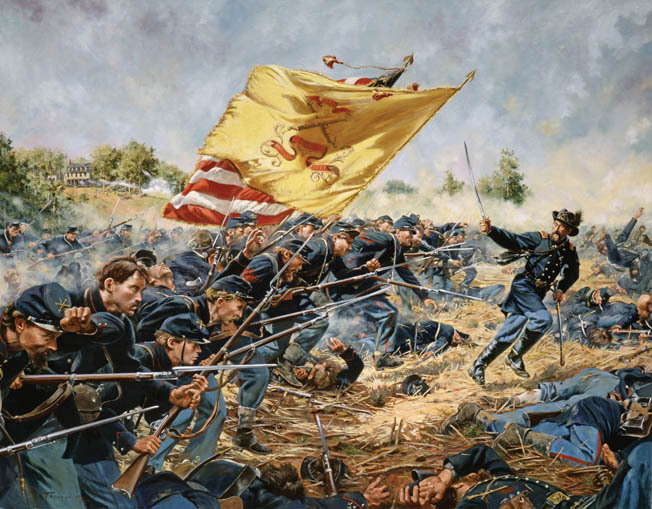 The soldiers of the 7th New York fought desperately to seize the flag of the 26th Virginia. Their own color bearer had fallen during the charge, and five of his fellow soldiers were killed trying to advance the colors amid the hailstorm of canister and bullets sweeping the landscape. The bluecoats shot the color bearer of the 26th Virginia, but before he died he managed to strip the colors from the staff and throw them to his fellow Virginians. A scrum ensued in which soldiers from both sides tugged at the prize. The New Yorkers won the tug of war and passed the prize back through their ranks to ensure that it stayed in their possession. Believing wrongly that the Confederates could not withstand an all-out assault at Cold Harbor, Lieutenant General Ulysses S. Grant attacked at daybreak on June 3, 1864. Three Union corps made the attack. All failed. To the left of Brooke’s brigade, Miles’s soldiers quickly lost heart after they suffered heavy casualties trying to advance across open ground west of the Dispatch Station Road. They came under the well-placed batteries of Lt. Col. William Pegram of Hill’s corps, whose guns atop high ground stopped Miles’s attack cold. The survivors of the first line retreated to the safety of the road, where they took cover in its sunken roadbed. One regiment on the far right of Miles’s brigade performed good service. Colonel Charles Hapgood, commanding the veteran 5th New Hampshire Regiment, saw the success of the 7th New York and ordered his troops to execute a half-wheel right and attack the salient where Morris’s soldiers had broken through the enemy line. The combined weight of the Federal attack finally routed the 26th Virginia. Union Colonel (later general) Nelson Miles. The Confederate regiments formed a second line to plug the breach. The 8th Florida Regiment of Brig. Gen. Joseph Finegan’s brigade charged toward the right flank of the 7th New York, screaming the high-pitched Rebel yell. They halted to fire two volleys into the New Yorkers and then charged, swinging their rifle butts and stabbing with their bayonets in an effort to retake the trenches. To the Floridians’ immediate south, 400 reinforcements of the 2nd Maryland Regiment counterattacked the 5th New Hampshire. Many of the Granite State boys tried to hide underneath or inside the main house and outbuildings of a nearby farm, but the Marylanders hunted them down and killed them where they hid. 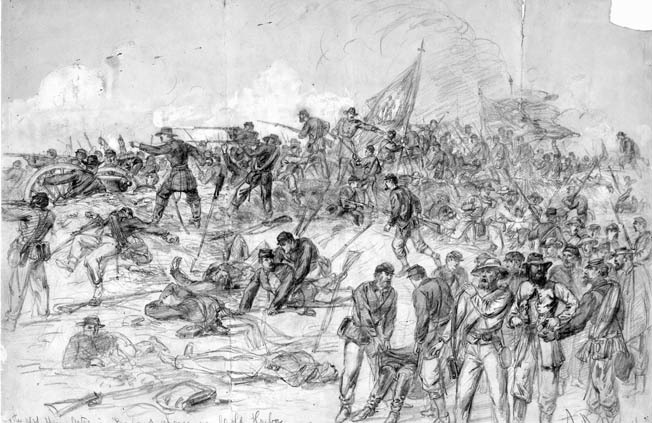 When Brooke rode back to lead forward his second line, he was wounded by shrapnel. At that point, the attack began to fall apart. The 7th New York was driven out of the enemy’s trenches and forced to retreat 300 yards. The attack was costly for the New Yorkers, who lost about 25 percent casualties of the 1,700 men who had participated in the assault. The 5th New Hampshire suffered an even higher loss rate, with about 40 percent of its 550 men killed or wounded. “We fought like hell and got licked like damnation,” wrote Lieutenant Frederick Mather of the 7th New York. Despite the repulse, Barlow’s division captured 425 prisoners and six guns. Gibbon’s four brigades were arrayed in similar formation to Barlow’s brigades, with two forward and two directly behind. The right wing consisted of Brig. Gen. Robert Tyler’s 4th Brigade, with Colonel Boyd McKeen’s 1st Brigade behind it. On the left wing, Colonel Thomas Smyth’s brigade was in the front, supported by Brig. Gen. Joshua Owen’s 2nd Brigade. 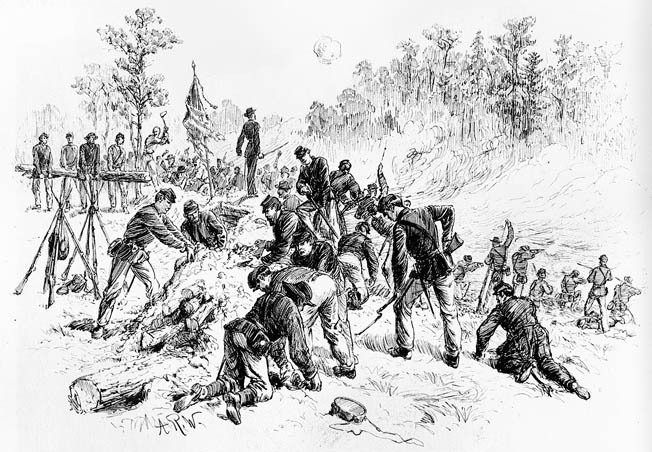 Soldiers of Major General Winfield Scott Hancock’s II Corps dig frantically with bayonets, tin plates, and bare hands to create earthworks before a Confederate countercharge. Tyler’s brigade was composed of five regiments from New York bolstered by the 1,600-strong 8th New York Heavy Artillery led by Colonel Peter Porter. The brigade’s right flank rested on the Cold Harbor Road. The New Yorkers faced five Georgia regiments belonging to Brig. Gen. Alfred Colquitt’s brigade. To reach the Georgians’ fortified position, Tyler’s brigade had the unsavory task of traversing the muck of Boatswain’s Swamp. To the left of Tyler’s brigade, Smyth’s brigade faced Brig. Gen. James Martin’s North Carolina brigade. Forming a second line behind Hoke’s division were the five brigades of Maj. Gen. William Mahone’s division. All that could be reasonably expected of Gibbon’s men was that they capture the first line of enemy trenches in front of them. Gibbon’s men went forward 15 minutes after Barlow’s soldiers began their attack. With bayonets fixed, the soldiers of Tyler’s brigade surged forward, making their way as best as they could through the swampy muck. Colquitt’s Georgians, formed in two lines, delivered a pair of strong volleys—one from each rank—when the New Yorkers were within range, then began firing at will. The Union attack was shattered before it reached its objective. “Balls commenced to literally mow us down,” recalled Lieutenant John Russell Winterbotham of the 155th New York. Tyler left the field after shrapnel mangled his ankle. Porter fell mortally wounded with a half dozen bullet wounds in his crumpled body. The only success enjoyed by Tyler’s brigade occurred on the left flank. Because Tyler’s battle line was so long, Colonel James McMahon’s 164th New York overlapped the extreme left, which was held by the 17th North Carolina. The Tarheels were armed with older muskets that fired buck-and-ball and caused heavy casualties at close range. McMahon’s soldiers overran an advanced position held by the North Carolinians, netting 45 prisoners, and continued toward the main line. Despite heavy enemy fire, they reached the line and began fighting hand-to-hand before being driven back. McMahon was reluctant to break off the attack, even though he was outnumbered. When the Tarheels called on McMahon to surrender, he refused, and they shot him down at point-blank range. The 164th New York paid a heavy price for its bravery, losing 11 officers and 143 enlisted men. After Tyler’s attack was repulsed, McKeen led his men forward against Colquitt’s steady line. The 29-year-old Princeton graduate accompanied his first line in its advance and was instantly killed. The lead elements of the brigade took cover in a depression 75 yards from the Georgians’ position. Command of the brigade fell to its senior regimental commander, Colonel Frank Haskell of the 36th Wisconsin. When the advance resumed, Haskell was shot in the head. At that point, the survivors of McKeen’s failed attack began to entrench. Sword-waving Major Christopher Crossman leads the doomed charge of his 1st Maine Heavy Artillery at Cold Harbor. Painting by Don Troiani. On Gibbon’s left, the regiments of Smyth’s brigade encountered such galling fire that they halted and began digging in 50 to 100 yards from the enemy main line. Gibbon, sensing that different tactics were called for, ordered Owen to attack with his regiments in columns to provide depth to the attack. But seeing that Smyth’s troops had broken off their attack and were entrenching, Owen chose to do the same. Hancock had established his quarters at Burnett’s Tavern in Cold Harbor. He was close enough to the battle that enemy artillery shells crashed around the crossroads and into the artillery park located nearby. Two of his staff were wounded by shrapnel. The battle-hardened corps commander was shaken to learn that he had lost eight of his colonels and 3,000 other soldiers in the failed attack. Wright’s VI Corps, which was adjacent to Hancock’s right flank on the north side of the Cold Harbor Road, occupied a narrow front. Wright’s three divisions were almost on top of one another, and they were closer to the Confederate line than to other Federal units. Opposite Wright’s corps were six Confederate brigades, two of which belonged to Hoke’s division and four that belonged to Anderson’s I Corps. The Confederates enjoyed an excellent defensive position. With Wright’s tacit approval, his division commanders—Brig. Gens. David Russell, Thomas Neill, and James Ricketts—ordered a limited assault in which their troops were to advance within 80 yards of the enemy line and establish a new position. When they reached their stated objective, half the men in each forward regiment dug in while the other half returned the enemy’s fire. Although losses were light compared to those suffered by the frontline units of Hancock’s corps, Wright’s regiments still suffered significant casualties as a result of their exposure to artillery fire and enemy sharpshooters, the latter of whom enjoyed nearly complete protection behind log barricades. Smith’s well-rested XVIII Corps prepared to launch a major assault of its own. 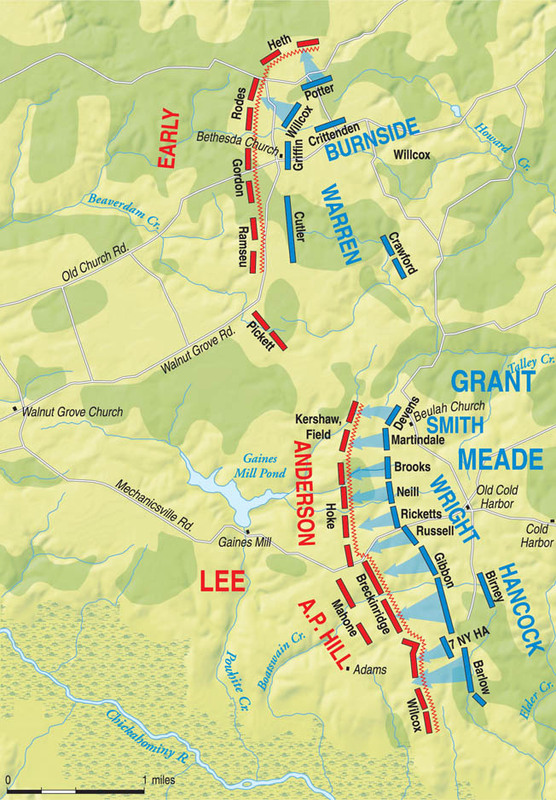 Whereas Hancock and Wright had launched their attacks on a wide front, Smith ordered his two divisions to advance in columns of massed brigades. Brig. Gen. John Martindale deployed his two brigades in column formation on the right, one on each side of a wooded swale. To his left, Brig. Gen. William Brooks deployed one of his four brigades in a single column. The attacking brigades were to advance through a belt of woods that Smith believed would furnish some measure of protection from fire. Unknown to Smith and his division commanders, the Confederate line in that sector was configured to trap whatever Union troops charged into it. Generals Joseph Kershaw and Charles Field had deployed their troops in a horseshoe configuration that would allow them to catch assaulting forces in a crossfire. Behind the breastworks, the Confederates were arrayed shoulder to shoulder in two ranks. Leading the Union attack on the north side of the swale was dashing 26-year-old Colonel Griffin Stedman, who waved his sword as he rode at the front of his brigade. Before the attack, his regimental commanders had requested permission to deploy into line of battle once they came under heavy fire, but Stedman had forbidden it. The woods along the swale furnished protective cover for only about 50 yards. After that, the enemy fire grew to a deafening roar and the landscape was quickly blanketed with dead or dying Federals. Because of heavy battle smoke, the men in Stedman’s lead regiments could not see the faces of Brig. Gen. Evander Law’s Alabamians, who were firing steadily into their ranks. “To those exposed to the full force and fury of the dreadful storm of lead and iron that met the charging columns, it seemed more like a volcanic blast than a battle,” wrote Captain Asa Bartlett of the 12th New Hampshire, the lead regiment in Stedman’s attack. Stedman’s attack was easily shattered. The 12th New Hampshire alone lost 50 percent of its soldiers in the attack. When the other regiments behind it saw the fate of the 12th New Hampshire, they withdrew to the tree line and began to entrench. On the south side of the swale, Martindale’s left column, led by Brig. Gen. George Stannard, fared no better. Twice Stannard sent his men against the Confederate breastworks, but they were easily repulsed. Once it became apparent to Kershaw that a major assault was under way, he ordered Brig. Gen. Goode Bryan to move his Georgians forward to reinforce Law’s men. There wasn’t enough room at the packed breastworks for the Georgians, and they passed forward loaded rifles to the Alabamians so the front-line troops would not have to reload. Law, in the thick of the fighting, shared the sentiments of many of his fellow veterans. “It was not war, it was murder,” he wrote. On Stannard’s left flank, the lead regiments braved a storm of lead and iron in an effort to reach the enemy barricades. Lending firepower to the Confederate infantry were cannon belching forth double loads of canister that stopped the blue-clad infantry in their tracks. “There was a helpless mob, a swarming multitude of confused men,” wrote a Confederate artillerist who witnessed the assault. “They were falling by scores, hundreds. The mass was simply melting away under the fury of our fire.” Smith, on hand to witness the repulse, told the brigadier to reform his survivors at the tree line and entrench along the same line as Martindale’s two shattered brigades. Between them, Smith and Wright lost about 1,800 men. From his headquarters in the rear of Wright’s corps three quarters of a mile north of Cold Harbor, Meade received regular updates from each of the three corps in the main assault. As soon as he received the dispatches, he forwarded them to Grant, whose headquarters was a mile behind the front line near VI Corps’ field hospital. Meade contacted Grant by telegraph at 7 am to determine whether the assault should continue. “The moment it becomes certain that an assault cannot succeed, suspend the offensive, but when one does succeed push it vigorously, and if necessary pile in troops at the successful point from wherever they can be taken,” Grant replied vaguely. Meade continued to press his corps commanders so as not to appear weak to Grant. When the three corps commanders received Meade’s orders, they passed them along to their division commanders but simply looked the other way to avoid what Smith deemed “a wanton waste of life.” The division commanders had seen enough slaughter for one day, and they found a way to circumvent any further assaults. “To move that army farther, except by regular approaches, was a simple and absolute impossibility, known to be such by every officer and man of the three corps engaged,” wrote Colonel Martin McMahon, VI Corps’ chief of staff. “The order was obeyed by simply renewing the fire from the men as they lay in position.” Griffin Stedman was less restrained. “I will not take my regiment in another charge if Jesus Christ himself should order it!” he shouted. Although the Federals remained in position for more than a week, the frontal assault on June 3 was the last organized fighting at Cold Harbor. For the next three days, the two sides clung to the ground within easy shooting distance of each other. Anyone foolish enough to climb to his feet was quickly shot down. “Thousands of men were cramped up in a narrow trench,” one Confederate officer recalled, “unable to go out, or to get up, or to stretch or to stand, without danger to life and limb; unable to lie down, or to sleep, for lack of room and pressure of peril; night alarms, day attacks, hunger, thirst, supreme weariness, squalor, vermin, filth, disgusting odors everywhere.” Neither Grant nor Lee was willing to allow a flag of truce for the removal of the rotting dead who lay between the two lines. One grievously wounded Union soldier ended his suffering by cutting his own throat with a pocket knife. A blurry horseman is visible at the far left of this period photograph of hastily constructed breastworks on the far left of the Confederate line at Cold Harbor. When the commanders finally agreed to a truce on June 7, there were few wounded men left alive to be rescued. It remained only to bury the dead, which work parties from both sides accomplished by shoveling the bodies into shallow, maggot-filled graves. On June 12, the Federals began another march around Lee’s left flank across the James River to the railroad hub at Petersburg, where they dug new trenches and resumed static warfare. Cold Harbor was Lee’s last major victory over a Federal army. As for Grant, it was a sobering experience that steeled him to more hard fighting in the months ahead. Following the war, however, Grant had ample time to revisit the June 3 repulse. When he penned his memoirs two decades after the war, he expressed regret—the only one he admitted to having about the entire war—that his grand assault at Cold Harbor had cost so many lives for so little gain. It was, he said, “the only battle I ever fought that I would not fight over again under the circumstances.” The men he had commanded at Cold Harbor no doubt shared that sentiment. Tags A.P. Hill, Abraham Lincoln, Ambrose Burnside, Army of Northern Virginia, Army of the Potomac, Battle of the Wilderness, Charles Field, Cold Harbor, Confederacy, David Russell, General Benjamin F. Butler, General George G. Meade, General Gouverneur K. Warren, General Jubal A. Early, general pierre gustave toutant beauregard, General Winfield Scott Hancock, Horatio Wright, James River, Jefferson Davis, John Gibbon, Overland Campaign, Robert E. Lee, Rudolph Barlow, Ulysses S. Grant, Union Army, Winfield Scott.